A bike’s view: This curve is on the first 3-mile section of Riverside Drive to be widened. On the mid-valley cycling front, things have been happening on two routes. The Albany City Council has confirmed its support for an Albany-Corvallis Bike Trail, though not necessarily along the alignment that has run into strong opposition from farmers, the Oregon Farm Bureau and the state Department of Agriculture. And Linn County says it is still committed to widening Riverside Drive, but it has run into complications that may double the cost of at least the first phase. On the Albany-Corvallis path project, the Benton County Planning Commission will, on Feb. 17, consider action on Benton County’s request for a conditional use permit to run the central 5.5-mile segment of the path along the north side of the Albany-Corvallis rail line, which would take about 13 acres of land zoned exclusively for farming. A dozen farm and landowners along the route oppose the plan. 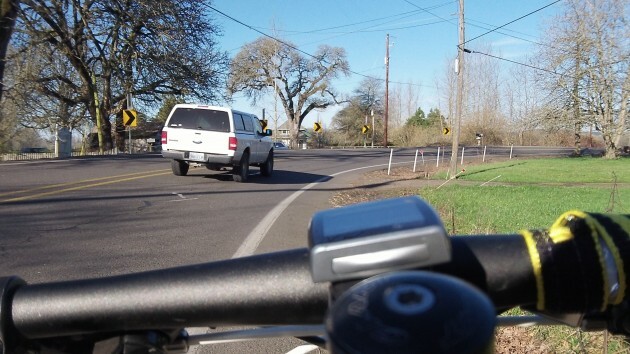 Meanwhile in Linn County, Roadmaster Darrin Lane has provided an update on the status of the long-planned widening of Riverside Drive, which would make it a safer route for cyclists. The first phase of the widening is to cover three miles from Oakville Road to Meadow Road. “Unfortunately we have identified several issues that will adversely impact the cost and schedule of the project,” Lane said in an email. One is the need to identify and mitigate wetlands. Another is that if the county acquires more right of way, which will be necessary in some spots, the ground will have to be studied for Indian or other archeological artifacts. One little quibble here about the bureaucratic phrasing. Mr. Lane says, “the need to identify and mitigate wetlands”. Many would argue there is no real “need to” there is only the federal mandate of “have to”; requirements that of course, the federal government does not fund. Just another example of the federal government run amok by “Progressive” politicians who believe they know better what is good for us than we local bumpkins. I’m somewhere on the “progressive” half of the spectrum, but in this case I totally agree. All you need to do is look west from Riverside Drive and the wetland is obviously somewhere way down there, not up here. Bike routes, bike routes, bike routes….. all this talk, conjecture, threats of land take overs. Here’s an idea and this “route” is already in place & has been for years. It’s called the BUS! It goes to & fro from Albany to Corvallis. You put your bike on the front. Ride in relative comfort no matter the weather. You avoid the dangers of traffic. But alas, it’s too simple of an idea. I’ve used the Linn-Benton Loop a couple times over many years, compared with many bike transits, mostly on Riverside Drive. 1 – By the time it takes to download the PDF schedule, figure out when and where it stops, wait and go there, and wait again, I might as well just ride all the way. 2 – The last bus back to Corvallis leaves 5:40pm which is 2-3 hours before sunset half of the year. No Sundays. It’s mostly intended to serve Albany residents working in Corvallis. Those are just two of my personal issues. There’s a lot to say for and against buses vs bikes vs the status quo of heavily car-dominated transportation almost everywhere in the USA. I’m sorry you’ve forgotten how to bike Jim. I presume that at some point in your childhood you might have learned and maybe even enjoyed it. But people who want to bike between Albany and Corvallis don’t consider a bus (that goes once per hour and stops only at a few spots) an acceptable alternative any more than drivers would. Your government already spent multibillions to take over land, flatten it down and pave it to make sure you’ve plenty of routes for your preferred mode of transportation between any two points in the country. Let’s not pretend that it’s controversial just because we’d like an extra few feet strip. I agree that it’s sometimes convenient to take the bus, but the bus is not always a good alternative to riding. Many people ride for the exercise, which they aren’t going to get using the bus. The bus charges a fare, and although it is relatively small, why pay when you can go under your own power? The bus only has 2-3 spaces for bikes, and there’s no way to know whether a slot will be available or not. I’m glad for the Linn-Benton Loop is there, but it doesn’t run on Sunday or other times when it might be convenient. Should I just sit there wishing I could get to Albany? Nope. I’ll ride out there myself, on my own schedule. I enjoy the scenery, the fresh air, and the independence of riding. What I would like is the relative safety of a wider shoulder or a designated path.